LA metro is only 12,562km². The CSA land area number for LA includes up to ~60,000km² of uninhabited Sonoran Desert and mountains. It just so happens that Riverside and San Bernardino counties that are included in the CSA extend all the way to the Nevada/Arizona border since the land in-between is uninhabited. Sonoran Desert is larger than Great Britain in land area. Note that I use CSAs definitions on my ranking, not MSA. If we do the same exercise on Lombardia, excluding all the rural areas, we would cut it in half, without losing almost no population or GDP for Milan. On the same way big counties deform Los Angeles CSA, the borders of NUTS-2 makes European regions bigger on my list. Better than Yuri's crazily distorted metro area figures, here is the GDP of the metro areas of the world calculated by the OECD (so non OECD countries are not included), using an internationally harmonized definition of the metro areas used for all the metro areas. This is the result of a project that has taken several years of work by OECD teams of statisticians. 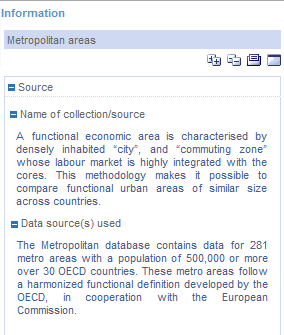 Certain facts stick out, such as the larger population of LA compared to New York when using the same harmonized international definition, or the rather low ranking of the Australian metro areas despite the high GDP per capita of Australia (that's because contrary to most other OECD countries, in Australia a lot of the GDP is produced outside of the metro areas, in the mines and quarries or the vast interior). The Canadian metro areas suffer from the same issue, to a lesser extent. Those numbers are made up. None of the statistical offices publish GDP to this level. New York with 16 million, Mexico City with 40% of GDP. It's just trash. OECD = Organization Engaging in CRAP Data! I think the GDP per capita of Paris's urban area is around €70k by Eurostat measurement, while that of Lyon, 2nd in France is somewhere between 40 and 45k euros. OECD must just be including a larger area of the Paris region in their stats. Thank you Yuri, I always appreciate the work you put in to provide this data. Glad to see with the 2017 numbers Cleveland has now grown faster than the national average. I would say its a nice surprise, but as someone who lives here and works in local government, its not a surprise. Our economy has been on fire lately, which as been a welcome change from the last few decades. Not only with regards to GDP, but jobs wise, the metro area is finally back to the level we were in 2000, when that recession led to the start of a long period of stagnation (in addition to the Great Recession). The last four months now YOY jobs growth has been at sunbelt levels, comparable to Portland, Denver, and Charlotte. Thank you Yuri, I always appreciate the work you put in to provide this data. Glad to see with the 2017 numbers Cleveland has now grown faster than the national average. Manufacturing-oriented metros were devastated in '09, so their '10-forward numbers are expectedly above-the-norm due to recovery. Look at Metro Detroit. Detroit appears to be growing far faster than Ann Arbor, but it's just a function of '09. It doesn't mean Detroit has a more robust economy. If you shifted one year earlier (or a year or two later) you would have very different numbers. We are talking about a over US$ 60,000 GDP per capita for Detroit MSA. Cleveland MSA, above US$ 67,000. Both one of the most productive and wealthy areas in the entire world. If growing from such a high base is not robust, I don't know what it is. Thanks Yuri for your work. Always a treat for the statistic addicts like me. Good to know NY is heading to 2 trillion mark. If not there in 2018. I was just reading today that the U.S. economy grew 3.5% this quarter. 0.2% greater than what was expected. Yeah those figures are rubbish. Some are off my a huge margin of error. Not even excusable. I wonder what there methodology is though? Maybe there's a reason for the madness. By country, and the change. Chris, it might take a while as New York CSA lost Allentown MSA and the Connecticut components keep growing at anemic rates. Tokyo was above US$ 2 trillion but fell below as Yen got weaker. Now it's getting stronger again, which might push Tokyo above it.